Let's shut down this BS shall we? Yesterday afternoon an attack on Westminster, the British parliament, left at least 4 people dead and many more seriously injured. As is often the case with incidents like this, misinformation was widely spread across media. Many news sites have now started debunking the incorrect stories floating around which we have gathered here to help you identify what's real or not. 1. The attackers name is NOT Abu Izzadean. This was from a report on Channel 4 news. BuzzFeed News confirmed that the real Abu Izzadeen is in fact in prison. C4 has since retracted its claim. 2. Nor was it this guy. It's actually comedian Sam Hyde. It's not the first time this has happened either. 3. And it wasn't this guy either. Shout out to Elena Cresci for shutting down all this BS. 3. No, London has not been "shut down". Will be on Tucker on Fox News at 9 AM EST to discuss the terror act in London. "One man can shut down a city.."
All the trains were running during and after the attack, as was the tube. Most roads are still open. Restaurants are still serving food, cafes are still selling flat whites, the River Thames is still flowing, pigeons are still pooing on everyone etc. 4. This tube sign is fake. 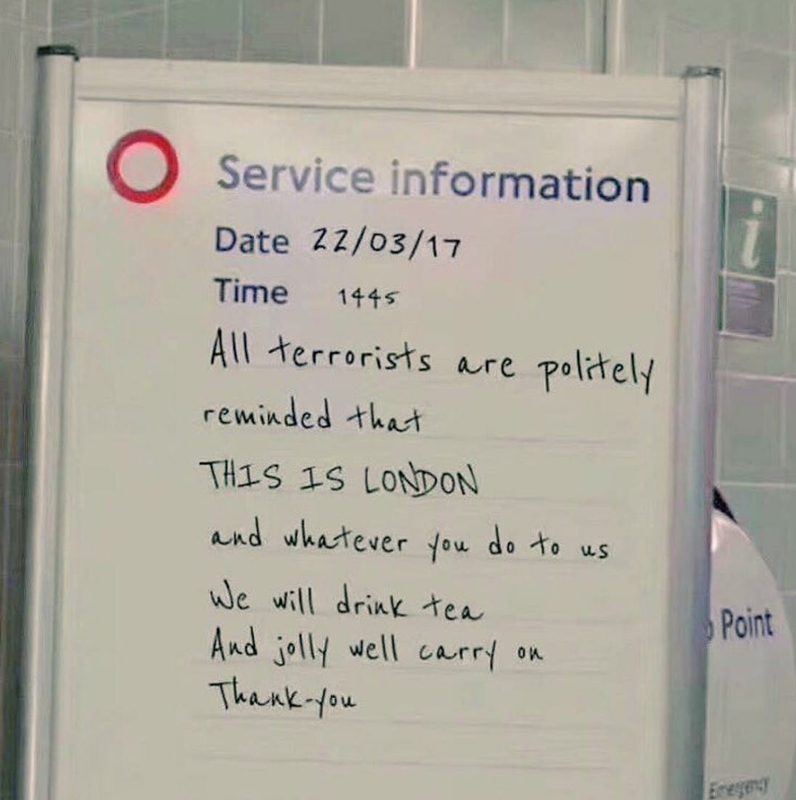 This photo of a Tube information sign was being shared widely this morning but it's fake (it was made by a tube sign generator). London Tube signs are usually a lot wittier than this tbh. 5. Sadiq Khan, the mayor of London, didn't say "terrorist attacks are "part and parcel" of life" immediately after the attack. The quote was picked up after Donald Trump Jnr tweeted it immediately after the attacks. However, the quote was in fact from an interview from September 2016. Trump Jnr was been fiercely criticised for his poor timing and judgement after sharing the quote. 6. This woman isn't missing. Her name is Tamara de Anda and she is a Mexican journalist. She's confirmed she is safe and well in Mexico City, where she lives. It always pays to be cautious before sharing any information on social media when incidents like this happen. Sharing fake images or misinformation can often have serious effects on those affected. When in doubt, always check with local law enforcement agencies if they have/can confirm the legitimacy of stories.